The former Regime’s security services protected the President, secured the presidential palace grounds, and guaranteed loyalty to the Regime. These organizations, however, also concealed information and material from United Nations weapon inspectors. This annex will provide a view of the most recent organizational structure of these security services. The Special Security Organization, using personal escorts and protection units, maintained the innermost security levels surrounding the President and the Regime. The Republican Guard, comprised of the Special Republican Guard and the Republican Guard Forces Command, served as the outer rings of Regime and national security. Prior to 1996 the Special Republican Guard was specifically tasked to conceal WMD-related material in collaboration with the Special Security Organization. The National Security Council provided a forum for cooperation between Iraq’s security and intelligence agencies regarding overlapping issues among the agencies and joint-service projects. 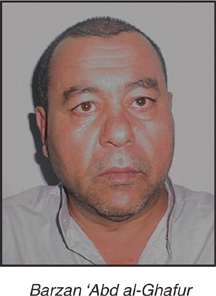 It was comprised of ‘Izzat Ibrahim Al Duri, ‘Abd Hamid Mahmud Al Khatab Al Nasiri, and the directors of the four main security and intelligence organizations—the Special Security Organization (SSO), the Iraqi Intelligence Service (IIS), the Directorate of General Military Intelligence (DGMI), and the Directorate of General Security (DGS). ‘Izzat Ibrahim, Vice-President and the Vice-Chairman of the Revolutionary Command Council (RCC), acted as the chairman, and ‘Abd acted as the Secretary General of the National Security Council. The Council did not have regular preplanned meetings, but it met periodically at ‘Izzat’s headquarters at Al Admani Palace in Baghdad to address any problems or issues that had emerged since the last meeting. Despite these meetings most problems—big or small—were brought directly to Saddam by the agencies’ directors. The presidential secretary, ‘Abd, screened almost all of the reporting sent to the Presidential Office by the SSO, IIS, DGMI, and DGS. The directors of these organizations, including Qusay Saddam Husayn, who headed the SSO, reported directly to ‘Abd, who chose what should proceed to the President. The correspondence from the SSO and IIS was opened by the presidential secretary himself, and not the staff. ‘Abd then evaluated whether it was for the President’s action or Daily Brief. If the matter related to routine administration, the Secretary acted on the correspondence, himself, and then he returned it to the originating office. However, this did not include the hiring and firing of department directors. The presidential secretary had a higher status than Qusay prior to 2001. Qusay, as Director of the SSO, still had to report to ‘Abd despite being the President’s son. Qusay was no longer within ‘Abd’s chain of responsibility after Qusay was elected to the Ba’th Party Leadership in May 2001, however, the SSO was still required to report to the presidential secretary. Saddam Husayn formed the Special Security Organization (Jihaz al-Amn al-Khass in Arabic) shortly after he became President in 1979. The assurance of Regime stability required a wide spectrum of support and services, and Saddam relied on the expertise of the Special Security Organization (SSO) until 2003. Saddam used the SSO, which consisted of over 5,500 personnel, to reveal any threats to him and his position. Husayn Kamil Hasan Al Majid headed the SSO from as early as 1983 until 1989, according to a senior Republican Guard officer. By 1987, he was also the “Overseer” of the Military Industrial Commission, the Republican Guard (including the Special Republican Guard), Saddam’s Special Presidential Guard, and the Ministry of Oil. Husayn Kamil did not appear to rely on deputies. He had the power, because of his family ties and proximity to the President, to have anyone fired or have them placed under suspicion. A former subordinate noted “Husayn Kamil did not have a right-hand man, as he was too arrogant.” Many of the senior leadership believe that all of Iraq’s problems with the United Nations were the result of his unilateral decisions. He was briefly appointed to and eventually fired as the Minister of Defense in 1991, after which he was appointed by Saddam to be the Minister of the Military Industrial Commission. His transfer from the SSO in 1989 created a gap in SSO leadership (See the “Husayn Kamil” textbox in the Regime Strategic Intent chapter for additional information). 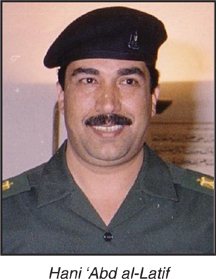 During the first Gulf War, Fannar Zibin Al Hasan, a cousin of Saddam, directed the SSO. Fannar was a figurehead. Qusay Saddam Husayn, who was appointed by Saddam to be the deputy director, actually led the organization. Little is known about the SSO leadership from 1989 to 1991. 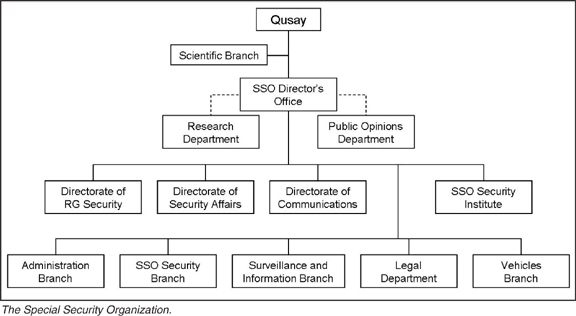 Qusay became SSO Director in late 1991 or early 1992. 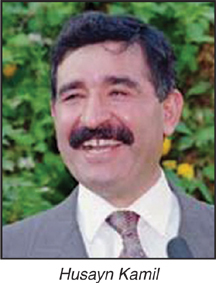 The security organization lost much of its influence without Husayn Kamil. Many of the responsibilities were not passed to Qusay because he was viewed as inexperienced—he was approximately 24 years old when appointed to direct the SSO. Qusay was a graduate of the College of Law; he was not given military rank and always wore civilian clothes. For this reason Qusay enlisted the assistance of Husayn Kamil for leadership guidance. With the assistance of Husayn Kamil from 1991-1995 and under the leadership of Qusay, the SSO undertook many functions, such as protection, collection, and deception operations. Together, these two used the assets at their disposal to orchestrate a denial and deception program against the United Nations. After the departure of Husayn Kamil in 1995, Qusay supervised the command authority of the Republican Guard and the Special Republican Guard while simultaneously serving as director of the SSO. In title, Qusay was referred to as the “Honorable Supervisor of the Republican Guard,” but he was never referred to as “the commander.” Qusay was able to manage the SSO, though he did not have the seniority, experience, or depth in military matters to command troops. Commanders feared and respected Qusay because, much like Husayn Kamil, he had almost-absolute power in the Regime. When he spoke to military commanders, however, he would generally issue vague managerial directives. Qusay stepped down as the Director of the SSO after he was elected one of two deputies in charge of the military branch of the Ba’th Party on 19 May 2001, three days after being elected to Ba’th Party membership. Managing his new responsibilities in addition to his role in the SSO was reportedly a heavy burden on Qusay. Staff Maj. Gen. Walid Hamid Tawfiq held the position of SSO Director from June 2001 until September 2002. Walid, a staff major general at the time, was selected to fill Qusay’s position because he was the most senior officer within the SSO. Qusay wanted to appoint the Director of Republican Guard Security to the position of SSO Director, but that officer was only a colonel. Qusay never completely relinquished control of the SSO. Qusay ordered Walid to report directly to him, though the normal chain of reporting for the SSO Director was to report security matters to the presidential secretary, ‘Abd Hamid Mahmud Al Khatab Al Nasiri. 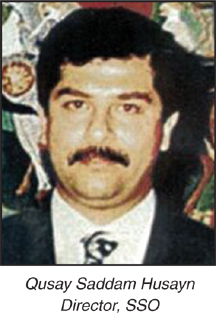 Qusay eventually relieved Walid of duty and returned as the Director of the SSO in September 2002. The circumstances around Walid’s reappointment to the Governor of Al Basrah are uncertain. 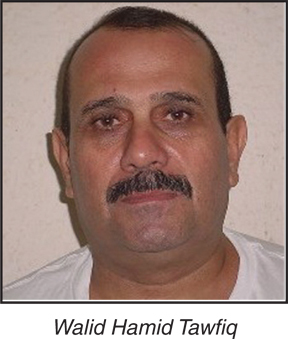 Walid claims that he was removed one week after he received a letter from Saddam admonishing him for monitoring an individual who was, without the knowledge of Walid, close to Saddam. Graphic: The Special Security Organization. Unlike the Iraqi Intelligence Service (IIS), the directorates and branches of the SSO did not have a coded nomenclature. The first tier of security closest to Saddam took no direction from the SSO, as this responsibility was removed from the SSO during the late 1980s. The Himayah (Arabic for “Protection”), a general term for the Department of Senior Escorts (al-Murafiq al-Qadim) was composed of two groups, the Special Protection (Amn al-Khas) and the Special Guard (Haras al-Khas), which were directly accountable to the Secretary of the President, ‘Abd Hamid Mahmud Al Khatab Al Nasiri. The Special Protection was with the President 24 hours a day, seven days a week to provide personal security. The Special Guard had more of a logistic role, providing personal services such as laundry, food, and shopping. 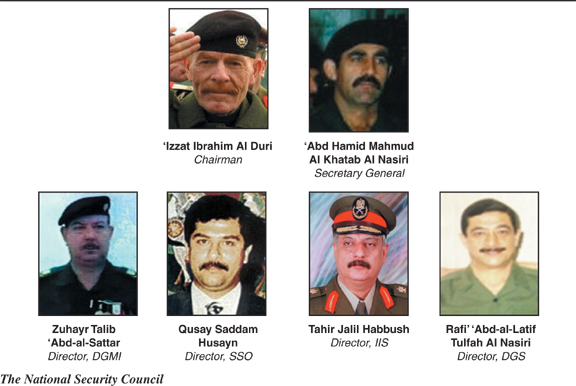 The SSO picked the candidates and monitored the members of this group to ensure loyalty to Saddam. The Office of the Director contained the staff closest to Qusay and daily SSO operations. Qusay relied less on the established officials of the organization, and by 1998 he developed his own close circle of personal aides much as his father had done. Among them were ‘Ali Husayn Al Rashid, Qusay’s longstanding personal bodyguard; Hani ‘Abd-al-Latif Tulfah Al Nasiri, the first cousin of Qusay’s mother; and Suhayl Muhammad Sultan Al Duri, Qusay’s secretary, Director of Public Relations, and by default, the Official Secretary of the SSO Director (Office Manager). Suhayl replaced Sulayman ‘Ulwan Ibrahim Al Huraymis Al Nasiri who served as Qusay’s secretary since 1991 and Office Manager until 1997, when Qusay dismissed him. The director’s office had four sections that handled allocation of residential properties for SSO employees, administration of SSO computers, financial oversight, and the inter-office and outgoing mail. The Directorate of Security Affairs, the second tier of presidential protection, consisted of two sections that were charged with the security of presidential palaces, the office of the presidency, and Ba’th Party offices and headquarters. Made up of over 1,700 personnel, the Directorate of Security Affairs was the largest directorate and last headed by Col. Muhammad Rijab Al Haddushi. It supplied protective services to the Presidential Diwan and Ba’th Party Regional Command, as well as the support contingency known as “Group 40,” which was composed of drivers, cooks, and launderers who traveled with Saddam. 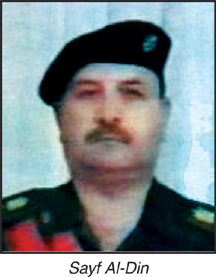 Hani ‘Abd-al-Latif Tulfah Al Nasiri, one of Qusay’s most capable deputies, headed this directorate, which monitored loyalty to the Regime within the Republican Guard. In 2001 Qusay told Staff Maj. Gen. Walid Hamid Tawfiq, despite Walid’s appointment to SSO Director, that he would not have control over Hani or his directorate. Hani retained his position of Director of the Directorate of Republican Guard (RG) Security as he ascended the ranks of the SSO. Three months after Walid was appointed as SSO Director, Qusay appointed Hani, his preferred choice for SSO Director, to the position of Assistant Director. Three departments within this directorate closely watched the SRG, the Allahu Akbar Operations Command (1st RG Corps), and the Fat’h Al Mubayyin Operations Command (2nd RG Corps). While not large enough to warrant their own departments, two SSO Security Officers scrutinized the RG Missile Command and the RG Airbase at Al Rashid, as well (see The Republican Guard section, below, for additional information). Prior to 1991 the SSO used security officers to monitor, educate, and discipline the military troops in an effort to protect against enemy intelligence. After 1991 the SSO shifted its focus to monitor the military commanders to guarantee their loyalty and political reliability. These security officers, reminiscent of Soviet commissars, were embedded within Republican Guard units down to the battalion level, and they did not answer to the RG chain of command. SSO Security Officers underwent a special three-month course held by the SSO, commonly wore civilian attire or military uniform without rank and, by nature of their positions, were not commonly liked by the other soldiers. In the event of disloyalty or a security breach, the security officer would report the event directly to the director of RG Security. For example, a security officer at the battalion level would not be required to pass the information through the brigade and division security offices. The Director of RG Security could bypass the SSO Director because of his special link with Qusay. Access control for incoming and outgoing palace visitors, to include verifying authorizations, security badges, personal and vehicular searches. Verifying personnel records for all inside and outside palace workers with the assistance of the Directorate of General Security (DGS). Escorting or monitoring all workers (janitors, waiters, contractors, etc.) in the presidential palaces. Requesting and validating annual security clearances from the Directorate of General Security for all enlisted and commissioned SRG personnel. Secure communications between strategic Regime facilities was the responsibility of the Directorate of Communications, directed by Head Engineer Safa’ Shakir Taha. This directorate established and maintained landline and wireless communications for all palaces, directorates, presidential and Diwan offices, and Republican Guard headquarters. Two departments within the directorate specialized in wireless and landline communications systems. The Landline Department was headed by Engineer Salam ‘Aziz; the Wireless Department was headed by Engineer ‘Abd-al-Rahman. Similar in mission to the RG Security Directorate or a police department’s Internal Affairs division, the SSO Security Branch monitored the personnel of the Special Security Organization. A cousin of Qusay, Fatik Karim Sulayman Al Majid, was the last known director of this branch. Fatik had almost constant access to Saddam, because the SSO Security Branch was Saddam’s window into Qusay’s inner circle. Saddam appointed strong loyalists, all of whom were members of his personal guard staff, to each of the security and intelligence services near the beginning of 2001. All of these positions reported the activities of their various agencies to Fatik, Director of the SSO Security Branch. Khalid Najim ‘Abdallah Sultan Al Majid Al Tikriti was appointed to head the IIS Security Branch (M6), Haytham Sulayman Al Majid was appointed to head the Security Branch for the Directorate of General Military Intelligence, and Salim ‘Abd-al-Qatar Sulayman was appointed to head the respective security element of the Directorate of General Security. Cross-checking of the various services placed the SSO in a superior position over these agencies. For example, the IIS was not informed of SSO operations, but the SSO would be informed of all IIS operations; only the liaison officers between the two organizations would communicate officially. If the IIS became aware of a Ba’th Party member plotting action against the Regime, the case would be passed directly to the SSO. However, if the IIS wished to keep a case, Saddam most likely would have been consulted. The Surveillance and Information Branch was tasked with monitoring Iraqi officials, all employees within the office of the presidency, and other designated targets, to identify individuals of questionable loyalty. The director of this branch, Rafi’ Hamid Muhammad Al Sagmani, oversaw the operations of two sub-sections, the Telecommunications Monitoring Section, headed by Muhammad Ra’uf Ghassub, and the Human Surveillance Section, headed by Harith Al Duri. Rafi’ was another of Qusay’s close associates within the SSO. The administrative branch of the SSO, which was headed by Wasfi Mukhlif Al Ajili, had four subordinate sections: Supplies, Services and Maintenance, Personnel (Human Resources), and Accounting, which handled salaries and promotions. Despite having its own motor pool and vehicles, the SSO attempted to acquire parts or maintenance for its own vehicles from the Special Republican Guard. Lt. Col. ‘Isam Mamud ‘Abdallah Al Tikriti headed the transport assets of the SSO. The Organization Section monitored all assigned SSO personnel except those on the presidential detail. It had one officer assigned to each of the other branches and directorates within the SSO. This section was headed by Mu’ayyid ‘Abd-al-Hamid. The Special Section monitored all assigned personnel to the presidential detail, including the protection detail, those who housed and provided logistics to the protection detail, and those who provided support services to Saddam (Group 40, shepherds for live meat, chefs, tailors, and day laborers). This section was headed by Sa’d ‘Abdallah Zahran. The Investigation and Interrogation Section conducted investigations, interrogations, and detention of personnel for crimes ranging from theft to treason. Its jurisdiction was determined by Saddam or Qusay. This section was headed by Col. ‘Adil Hamid Jamil. The Information and Identification Section maintained personnel files, marriage approval, weapons accountability, and organizational identification and passports for SSO personnel. The Information Section, also referred to as “Personnel,” was headed by Samir ‘Awad, and the Identification Section was headed by Muhammad Wahadi. The Separated Employees Section monitored all former SSO officers. Also known as the “Veterans’ Section,” this section was headed by Tha’ir Al Duri. The SSO operated a laboratory specifically to test the President’s food. All food, clothing, and presidential supplies were acquired through the Ministry of Health or the Ministry of Trade. This branch was headed by Dr. Sabah Shuhab Ahmad Al Sumaydi. His two immediate subordinates were Dr. ‘Adnan Ibrahim, Head of the Department of Chemistry, and Dr. Mujaz Tawfiq, Head of the Department of Biology. The lab tested anything specifically for the president, including clothing, and its function was very secretive, even within the SSO. For example, Qusay planned refusal to acknowledge that the lab belonged to the SSO, even if confronted by UN inspectors about the lab. The lab was previously declared as belonging to the Ministry of Trade, which originally set up the lab for the SSO. Therefore, UN inspectors examined the lab under the assumption that it belonged to the Ministry of Trade, yet, fully aware of the lab’s true function with regard to Saddam. Had the SSO acknowledged its ownership of the lab, it would have further increased the level of distrust between inspectors and Iraq. While many SSO officers were already seasoned from prior intelligence service positions, all SSO officers were trained in Baghdad at the Special Security Institute, directed by Khalid Kulayb ‘Awani. The Institute’s primary mission was to educate SSO, SRG, and presidential office employees on all aspects of governmental security, including military training, political indoctrination, and security of presidential sites. It operated on a yearly schedule with classes beginning on the seventh day of January, a two-month vacation in July and August, and completion of the annual curriculum in December. The basic course for Special Security Officers lasted three months at the Institute in the Al-Jihad district of Baghdad. The course consisted of physical security training relating to different types of facilities and premises, personnel security and search techniques, the debriefing of casual contacts, and methods used by hostile intelligence services to recruit sources. This course turned company-grade Republican Guard officers into SSO Security Officers, who subsequently were embedded into military units. The SSO had a battalion-sized unit responsible for the security of strategically important roads around Baghdad and Tikrit. 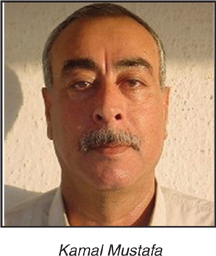 Hasan Na’amah Hamid Al Alusi replaced Col. ‘Uday Al Habbus as the commander of the Security Unit in 2001. The unit consisted of four companies and a command element. The first company was composed of police patrol cars, the second company were also police vehicles, including recovery vehicles, for traffic enforcement, the third and fourth companies were foot-patrols mainly recruited from the SRG. The unit’s main focus was the route between the Baghdad International Airport and the Republican Palace in Baghdad. Similar service was provided by the unit on other routes, but with less manpower requirements. These security operations were, generally, permanent assignments; the Security Unit was rarely tasked with other assignments. The Public Opinion Department collected information on all rumors regarding the Regime. This department, headed by Suhayl Muhammad Sultan Al Duri who simultaneously held the position of Manager of the Director’s Office, maintained sources in all major cities who would report on all facets of public opinion regarding Saddam or the Regime. The Legal Department, led by Judge Basim ‘Umar Al Tikriti, was responsible for all legal cases involving employees of the SSO. The Research Department, headed by Dr. Mu’ayyid Al Tikriti, conducted a joint computer project with the Military Industrial Commission, according to former senior officers within the SSO command leadership. Allegedly, this section was comprised of four or five employees in addition to Dr. Mu’ayyid and was financed through the SSO. Neither Walid nor Hani, despite their senior positions within the SSO, knew much about the department’s sensitive activities. The SSO collaborated with every Iraqi security or intelligence service on a limited scale—each service had a specific charter but overlapping responsibilities were common. Moreover, all of Iraq’s services were monitored for loyalty to the Regime. The SSO had links to every security and intelligence service of Iraq for political reasons, but it did not vet the reporting of the various agencies. All of the services shared similar reporting chains, however. Once a report had been seen by the director of the relevant service, it followed one of two paths: if the report related to administrative or financial matters, it went to the Presidential Diwan; if the report related to intelligence or security, it went to the Presidential Secretary. The security and intelligence services relied on each other for operational missions as well. The SSO would be informed if an agency had a security breach or suspected disloyalty among its ranks. Alternatively, the SSO tasked the Directorate of General Security for background checks and the Iraqi Intelligence Service and the General Military Intelligence Directorate for collection strategies and technologies. The Republican Guard (RG) consisted of two military branches charged with divergent missions outlined below. Nonetheless, both branches of the RG received orders from the RG Secretariat, which was directly subordinate to Qusay Saddam Husayn. The last officer to hold the position of Secretariat General, more commonly referred to as Secretary General, was Staff Lt. Gen. Kamal Mustafa ‘Abdallah Sultan Al Nasiri. The smaller RG branch, the Special Republican Guard, was the third tier of presidential security after the Presidential Bodyguards and SSO. The Special Republican Guard’s primary mission was the physical protection and security of the presidential grounds and other sites sensitive to national security. The larger contingent, the Republican Guard Forces Command, was often recognized as the “elite fighting force of Iraq” and was also the group most often referred to when speaking of the Republican Guard. 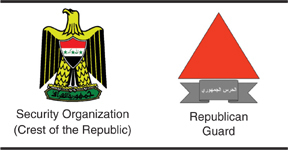 The Republican Guard Forces Command would be considered the fourth, and final, tier of the Regime security services. Qusay, in the role of the “Honorable Supervisor” of the Republican Guard, like his father, kept a keen eye on the military forces closest to the Regime. No piece of military equipment could be moved—even for repair—by a brigade, division, or corps commander without the prior written permission of Qusay through the RG Secretariat. Security officers from the SSO were embedded within the Republican Guard to ensure that this was strictly followed and report if it was contradicted. The primary mission of the Special Republican Guard (SRG) was to secure and protect presidential areas and other sites sensitive to national security. Although tasked with guarding presidential grounds, the SSO officers also conducted all personal and vehicular searches and internal security. The SRG was responsible for manning gate guards and securing the grounds, perimeter, and surrounding areas. Even the SRG Commander, Brig. Barzan ‘Abd-al-Ghafur Sulayman Al Majid, was not permitted to enter any presidential grounds without prior approval. Saddam ensured that all military units were kept far enough away in order to prevent any potential coup. The SRG was originally a large brigade composed of seven battalion-sized elements referred to as Regiments. The SRG bulked up to the size of a division in 1992 when the threat to the government increased, although it had never—before or after the threat—been trained for coup suppression. The SRG maintained its large stature until early 2000, when the branch could not support its own logistic requirements and was reduced from four brigades to one. It was again augmented to divisional size before Operation Iraqi Freedom, but the SRG units played no role in combat as maneuver units during Operations Desert Storm or Iraqi Freedom. The chain of command within the SRG was strictly controlled, given the proximity of military troops to Saddam. Orders could only be passed down from the RG Secretariat to the SRG commander. The SSO at times would attempt to commandeer SRG assets for ad hoc tasks, but the SRG Commander would refuse to allocate a single vehicle without an official written order from the RG Secretariat. The SRG, under the direction of the SSO, participated in WMD-related concealment activities from 1991 to 1995. Equipment, documents, and other unidentified sensitive materials from the Military Industrialization Commission were loaded on trucks and stored at SRG facilities in order to prevent their discovery by UNSCOM inspectors, according to numerous sources. 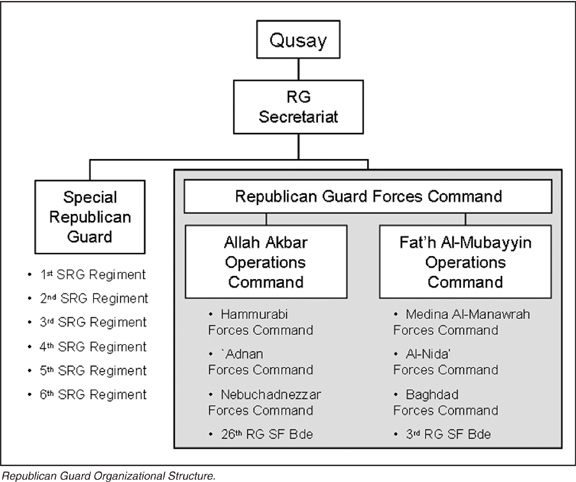 Graphic: Republican Guard Organizational Structure. The primary mission of the Republican Guard Forces Command (RGFC) was to safeguard Regime stability and to protect the Regime from both foreign and domestic enemies. RGFC units helped repel the Iranian invasion in the mid to late 1980s, invaded Kuwait in 1990, suppressed the Shi’a and Kurdish uprisings in the 1990s, and briefly defended the approaches to Baghdad in 2003. The mission of the RGFC resembled that of the Regular Army—tactical defense of the Regime and nation. The RGFC was composed of two corps-sized elements that were “supervised” by Qusay, but Staff Lt. Gen. Sayf-al-Din Fulayyih Hasan Taha Al Rawi, as Chief of Staff, was the operational commander. The original corps, the Allahu Akbar Operations Command (1st RG Corps), was dispersed in the northern half of Iraq and the other, the Fat’h Al Mubayyin Operations Command (2nd RG Corps), in the southern half of Iraq. Each corps had three division-sized elements referred to as a “Forces Command” and an independent Special Forces Brigade. Two of these divisions were garrisoned in Mosul and Krikuk to support the Regular Army in the north, three heavy (armored) divisions protected the approaches to Baghdad, and one infantry division was garrisoned in Al Kut. The RGFC was the last and the heaviest armed tier of Regime security. While it was essential to the protection of the Regime, Saddam kept the units away from Baghdad to prevent their involvement in any military-led coups.